The most active weather week since the start of the new year continues; following widespread light snow, sleet and ice on Monday, temperatures are currently in the upper 40s to mid 50s and are expected to continue rising ahead of a cold front, currently producing a widespread heavy rain and severe thunderstorm outbreak in the central US, which will move through the area tonight with rain up to/locally over 1 inch and wind gusts in excess of 50-55 mph. A colder and drier pattern will return for the weekend and next week. Just two days after a wintry weather event, temperatures are already unseasonably warm, in the upper 40s to mid 50s across the area. Temperatures will continue to rise today, peaking in the low to mid 50s in southern CT and parts of Long Island, and in the mid 50s to low 60s across the rest of the area. The potential is there for parts of the immediate NYC area especially just west and SW of NYC to surge into the mid to possibly upper 60s for a period of time later this afternoon. Breezy south winds are expected, which will intensify especially after 6-9 PM. A broad area of low pressure is currently located near the Great Lakes, with a stronger low pressure developing tonight towards Michigan and western NY state, moving into Canada afterwards while bringing a strong cold front through the region, affecting the area between at least 1 and 6 AM from west to east. This cold front has produced a widespread severe weather outbreak in the central US yesterday and in the Southeast and lower-central Mid Atlantic regions today; while weaker storms are expected for the area compared to those to the south, there is still a very strong low level jet expected, with 925mb winds as high as 80 knots, with some of those winds mixing down to the surface especially with heavy rainfall. Overall, with the cold front moving through, a squall line of heavy rain and thunderstorms is expected with up to 1 inch in a short period of time, resulting in areas of flash flooding especially north and west of NYC, with widespread wind gusts in excess of 50-55 mph. 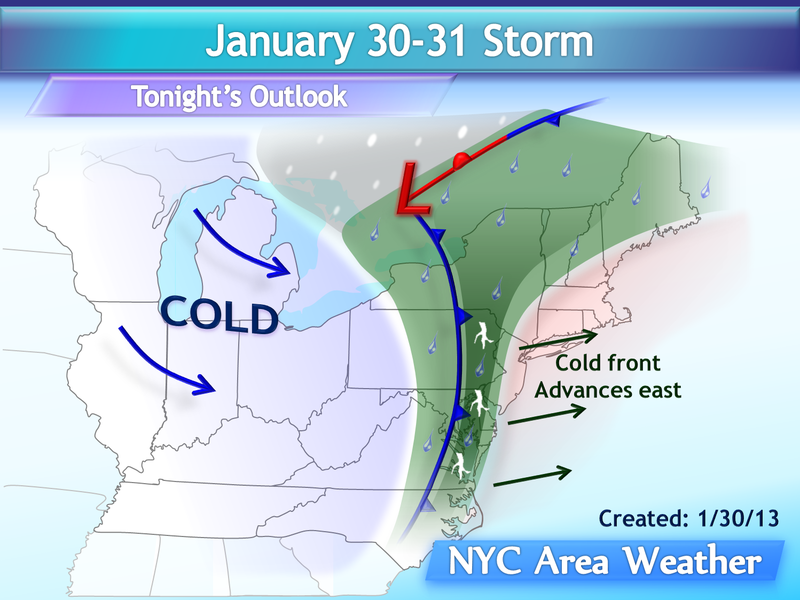 To the east of NYC, less rain is expected, generally up to 1/2 or 3/4 inch, but even stronger winds are expected with gusts potentially up to or over 60 mph. Behind the cold front, windy conditions will continue into Wednesday with gusts up to 45 mph expected. Storm updates will be posted tonight both in the blog and on Twitter. As last night’s pattern outlook mentioned, a stronger cold air mass will return into the region behind the cold front; much colder temperatures are expected, with highs back into the 30s and lows in the 10s inland and 20s for the rest of the area. Several weak low pressures will move through the region, each resulting in additional cloud cover and scattered snow showers; one is expected on Friday with isolated snow showers possible, but with minor accumulations staying south of the area. Another minor snow event is expected on Sunday with additional scattered snow showers and minor accumulations possible, followed by another light snow event on Tuesday. More information will be posted on these snow events with the next discussion after tonight’s storm. What time do you predict the thunderstorms will be moving through tonight? There will be occasional locally moderate/heavy showers west/north of NYC for the rest of the evening, but the heaviest rain is expected to move through generally between 1-5 AM west of NYC and 3-7 AM east of NYC, perhaps +/- an hour or so.